We were sitting outside a Portsmouth coffee shop last night laughing and talking with some of our dearest friends. It was a gorgeous summer night, dry and a little cool. The night was bringing all kinds of people out. We laughed at and admired a couple teenage guys who came by wearing sweatsuits from the 80’s. One of them had a boombox cranking disco music from atop his shoulder. They were smiling at and acknowledging everyone on the street. It was invitation and welcome. About 30 minutes later, as Jim, Alison, Robin and I sat praying together hippie style – heads up and looking around – the music started again. There, in the shadow of a historic New England church, kids danced freely on the street. I smiled watching a girl swaying back and forth, moving in large circles with her arms out like she was a child playing airplane. The disco boys started pulling people out of the crowd and into the dance. Teenagers, middle-aged tourists and passersby joined in the dance. Smiles, laughter, abandon. 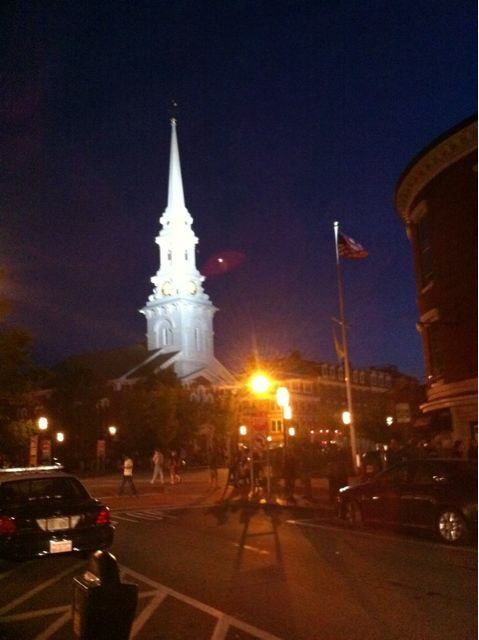 The giant brick building with its perfect white steeple lit against the night sky, stood watching over the crowd. If I were an animist, I’d say the building was sad. Sign-carrying Christians would say that it was sad looking at the crowd dancing to “godless music.” But it seemed sad to me as though it somehow longed for days past when God’s people danced with Joy. I think, if buildings could feel, it ached for times when Jesus followers set the tone and reached out enthusiastically inviting others to join the dance with a warm welcome for anyone who joined. I want my life to be a Jesus dance. Freedom. Joy. Laughter. Peace. I want to dance with people rather than apply another coat of paint on another lifeless, cold steeple.